Have you ever used a gazunder? How about a Jordan, po, Bourdaloue, jerry, or thunder bowl? These are all names that have been used to refer to a chamber pot. A chamber pot is bowl shaped, usually comes with a lid and handles and is used as a toilet. Generally it was kept under the bed or in a cupboard in the bedroom. You could use it in the night and then empty it during the day. 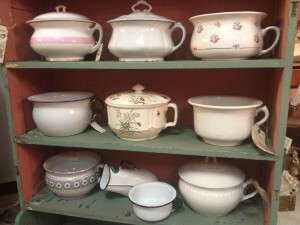 Chamber pots can still be found in antique malls. Some of them are so pretty that they are often used for planters or as a display for holding vintage collectibles. This sounds kind of gross now days but before the invention of chamber pots people would have to go out to the forest or field every time they needed to relieve themselves even if it was raining, dark of freezing outside. Imagine what a great invention the chamber pot was to people in those times. The first chamber pots were made from clay because it was cheap and waterproof. Later, they were mostly made from metal or ceramics. You would think that an item used for this purpose would be plain. However, many were painted with beautiful pictures and or designed in a beautiful fashion. Some were designed with gold and jewels for people of royalty. It is interesting to search on line for images of chamber pots and see all the different kinds that were made. The Bourdaloue was a chamber pot that was specifically designed for women. It was generally oval or oblong shaped with a slightly higher front part. There is an interesting story behind how these female chamber pots got their name. They are said to be named after the priest, Louis Bourdaloue (1632-1704) who gave very long sermons. The ladies had their maids carry in the Bourdaloue so they could discreetly use them under their dresses without having to leave the sermon! Thank goodness for modern plumbing!